What does the BUGCODE_NDIS_DRIVER error mean in Windows? The BUGCODE_NDIS_DRIVER BSOD (Blue Screen of Death) error may appear during the initialization process for Windows XP, Vista, 2000, 2008, and Windows 7 and 8. It means that a problem has been encountered during the loading of a faulty driver for a network device. This error promoted the abrupt shutdown of the computer to prevent damage and data loss. 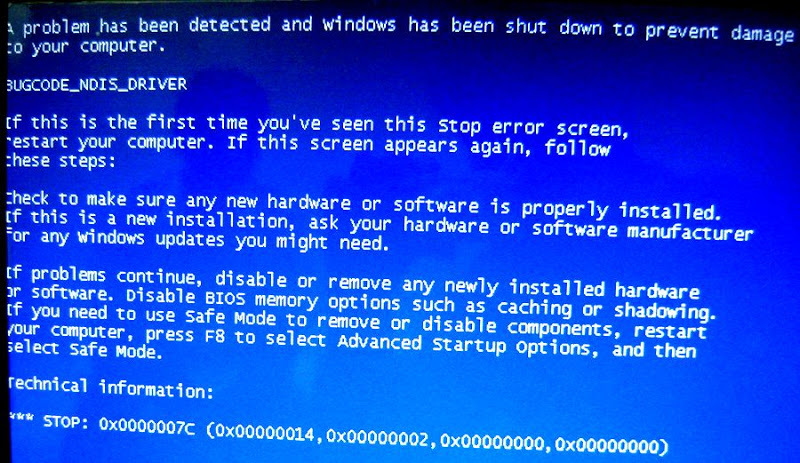 The BSOD error is usually caused by the faulty operations executed by the driver for a newly installed network hardware. The driver may be corrupted, outdated, or is incompatible with the operating system. The installation of a network hardware device that is incompatible with the computer may also cause this error. You can resolve the BUGCODE_NDIS_DRIVER BSOD error caused by a faulty driver or an incompatible hardware device by uninstalling the latest installed program and device. To perform uninstall in Windows Vista and 7, click on Start, Control Panel, and then Programs and Features. For Windows XP, click on the Start button, Control Panel, and then Add or Remove Programs. You can use the arrow key to highlight the software to uninstall, and then press Uninstall or Remove. Alternatively you can use Driver Reviver to update or roll back your computer drivers. If an out of date driver is the cause of the problem then this will fix the problem. You can also disable, update or rollback the faulty driver to resolve the BSOD error. To do this in Windows XP, click Start, right click Computer, and then select System Properties from the drop-down menu.From this tab, select Hardware, and then click the button for Device Manager. Locate the driver or hardware that has been identified to cause the BSOD error, double click the item, and then select the Driver tab. The Driver tab provides options to update, rollback to an older version, disable or uninstall the driver. Follow the prompts and instructions that appear on the screen to perform the selected option.